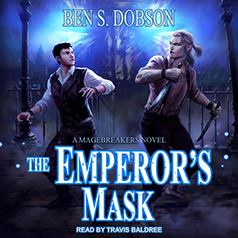 Ben S. Dobson presents the second book in the Magebreakers series. A killer walks among the rich and powerful. Who can the Magebreakers trust? Someone is killing the non-magical members of Senate houses—those who might one day be named Protector of the Realm. And that same someone is leaving behind messages for the Magebreakers beside symbols of the shadowy organization known as the Knights of the Emperor. Under suspicion from the constabulary, Tane and Kadka are drawn into the investigation to prove their innocence. What they find is that Audish politics are as dangerous as any Porthaven back-alley. Suddenly, they're surrounded by the most powerful figures in the realm, every one with a different agenda. Telling allies from enemies has never been harder, but Tane and Kadka will have to find someone to trust if they're going to bring the killer to justice. Their lives—and the future of the Protectorate—depend on it.